Fruit based puddings are generally lower in fat and sugar than cake and cream based puddings which can help everyone manage their weight better. Body weight is important to gut health, as research has shown that people who are overweight tend to have a more permeable gut and an altered gut microbiome. Including fruit in each meal of the day can help to improve the range of healthy bacteria in the gut and mange body weight at the same time. Labneh is simply strained Greek yogurt which makes it thicker and more spreadable. Make the labneh the day before. Line a large bowl with a square of clean muslin (or cheese cloth). Place yogurt in the centre and wrap the muslin around the yogurt and tie up with string. Suspend the muslin and yogurt over a deep mixing bowl and place somewhere cool. Leave the labneh to drain for at least 4 hours. This will make approximately 350g labneh. 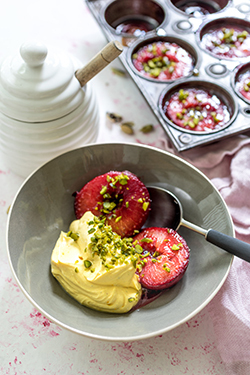 Other ripe fruits such as apricots and peaches can be baked and served with flavoured labneh or Greek yogurt. Baked rhubarb is a low FODMAP alternative to bake plums and is equally delicious.